Moisture and organic material attract gnats. Some species prefer the soil of houseplants, while others seek out decomposing food debris in garbage disposals or on damaged and over-ripe fruit. Any wetness in the home or unsanitary habits could draw them indoors and once inside, gnats are able to take advantage of conditions that are favorable for continuous development and reproduction. 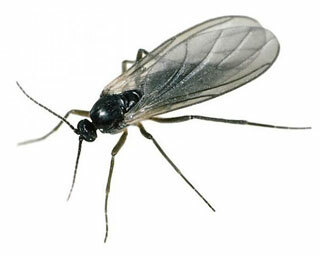 Gnats are a nuisance since they do not cause major damage to homes. However, gnats may threaten human health should they transport pathogens from their unsanitary development sites. Ground application : treat open areas near buildings and in campgrounds. Apply at a rate of 5 to 15 seconds per 10m2. Apply in swaths across area to be treated. Allow treatment to penetrate dense foliage. Best results are optained when there is no wind.